One of the more significant events in telecom history occurred today when SBC announced its decision to buy AT&T, the venerable telecoms giant that had been around since the invention of the telephone and founding of the company by Graham Bell, for $16 billion. This was probably inevitable as AT&T atrophied bit by bit after the 1984 court ruling. First the Baby Bells were spun off. More recently, the wireless business was bought by Cingular (majority owned by SBC), and now Ma Bell is no more. Baby plus Ma will probably become the largest telecommunications firm in the United States. AT&T tried to change, as it entered fields such as cable television and wireless phone service itself. But its efforts generally met with business disappointment, and it soon left both those fields. In April 2004, AT&T was dropped from the Dow Jones industrial average, signifying its lessening importance to the nation's economy. It was replaced by another so-called "Baby Bell," Verizon Communications. AT&T announced last July it was basically pulling out of the consumer long distance business that had been a core of its business since the court-ordered split-up of AT&T in 1984, and it took a $11.4 billion charge reflecting the reduced value of those assets in the third quarter last year. By the end of 2004, it had dropped to 24 million consumer customers, down more than 30 percent over the previous 12 months. The business long distance service has been waning as well. Om Malik seems to think this merger may affect the roll out of WiMAX. First it was the Sprint+Nextel merger that put the WiMAX ready spectrum out of reach, and now we have a situation where one of the most ardent supporters of the technology in the carrier space going straight into the arms of a company which owns a 3G/Wireless network - SBC. I wonder what happens to the AT&T+Intel deal to develop communications chips? A few months ago which conducting a panel for the folks over at the MIT Alumni Association, I sat with some AT&T execs who told me that they were going to seriously contemplate WiMAX because it cuts down their access charges. Well that won’t be much of a problem in a large part of the country. I have a feeling that WiMAX is going to be reduced to the role it was predestined for - backhaul in areas where fiber is too expensive to sink, at least for now. There was a time when Nicholas Negroponte was the reigning god of the dot-com/new media world. Since the collapse of the bubble and the winding up of Media Labs in both Asia and Europe, he's not been in the news much. Until today. Both Red Herring and the New York Times are carrying stories about Negroponte's idea for a $100 PC, from the WEF at Davos (where pointless discussions about the digital divide seem to have been shown the door, thank god). The machine is intriguing because Mr. Negroponte has struck upon a remarkably simple solution for lowering the price of the most costly part of a laptop - the display - to $25 or less. In partnership with Joseph Jacobson, a physicist at M.I.T., he wants to persuade the education ministries of countries like China to use laptops to replace textbooks. Mr. Negroponte said that he had found initial backing for his laptop plan from Advanced Micro Devices and said that he was in discussions with Google, Motorola, the News Corporation and Samsung for support. The device includes a tentlike pop-up display that will use the technology now used in today's rear-projection televisions, in conjunction with an L.E.D. light source. Mr. Negroponte and his supporters are planning to create a company that would manufacture and market the new portable PCs, with MIT as one of the stakeholders. It is unclear precisely what role the other four companies will play, although Mr. Negroponte hopes News Corp. will help with satellite capacity. An engineering prototype is nearly ready, with alpha units expected by year’s end and real production around 18 months from now, he said. The portable PCs will be shipped directly to education ministries, with China first on the list. Only orders of 1 million or more units will be accepted. I'll give him this much -- he's got the price point right. Long time readers of this blog will remember that I have constantly advocated that prices of computers needed to drop to around $100-$150 for computing to really take off in the developing world. I just wish Negroponte would talk to people like my colleague, Rajesh Jain, who has been working on the 'massputer' for a while now. During the time I was working in the Tsunami relief post, several people had written in from India to say that the bureaucracy was perceived to be doing a much better job than is the norm. Now, Sumit Ganguly has written a very interesting piece in The New Republic on India's response to the disaster and what its geo-political implications could be. Within 48 hours after the waves hit--and despite the near-total destruction of India's only Integrated Defense Command (linking the army, navy and air force) in the Andaman Islands--some 8,000 members of India's armed forces were fanning out to the affected areas of India and its neighbors. Apart from addressing the needs of homeless and bereaved fishermen in Tamil Nadu, they swiftly reached Sri Lanka, a country that has had a tortured relationship with India over the past few decades. On this occasion, however, the Sri Lankan regime did not look askance at the Indian humanitarian effort; instead it publicly welcomed the arrival of the substantial Indian relief contingent. The Indian Navy dispatched two hospital ships to Banda Aceh, Indonesia (it was the first time India has sent a hospital ship abroad) and provided several transport aircraft, a tanker, and a hydrologic survey vessel to the tiny island chain of the Maldives. Even Thailand, a far more prosperous nation, was the recipient of substantial Indian medical and emergency assistance. What does all this mean geopolitically? First, there is the fact that the left-of-center Congress Party-led government willingly worked with the United States in responding to the tsunami. In the past, such a regime would have gone to great lengths to torpedo any American effort to provide relief in the region. For example, when a massive cyclone hit Bangladesh in 1991, leaving extensive devastation in its wake, India expressed misgivings about the U.S. response, which was called "Operation Sea Angel." These anxieties, a product of the cold-war years, have steadily dissipated over the past decade, replaced by a willingness to work with, and even court, the United States on a range of issues, from anti-piracy operations in the Indian Ocean to jointly confronting terrorism. Indeed, the growing scope of military-to-military contacts between the two countries over the past several years (a centerpiece of the new Indo-U.S. relationship) made it possible for the two states to play a leading and coordinated role in post-tsunami relief. There are also regional ramifications to consider. India's willingness and ability to mobilize its civilian and military resources to assist Sri Lanka and the Maldives have not gone unnoticed. Most of the small South Asian states have long perceived India to be at best overbearing and at worst a regional bully. India's efforts to rush emergency assistance to Sri Lanka and its subsequent withdrawal of military forces when they were no longer needed has likely impressed India's neighbors (with the exception of Pakistan). Of course, as India's behemoth bureaucracy returns to dealing with more mundane tasks, as disputes arise again with the United States, and as the memory of the post-tsunami relief efforts fades, we may see a return to a less self-confident and more self-centered India. It is equally possible, however, that we have just witnessed the birth of a regional leader. Amazon.com's latest offering - photo-enhanced Yellow Pages. The most powerful technology A9.com invented for Yellow Pages is "Block View" which brings the Yellow Pages to life by showing a street view of millions of businesses and their surroundings. Using trucks equipped with digital cameras, global positioning system (GPS) receivers, and proprietary software and hardware, A9.com drove tens of thousands of miles capturing images and matching them with businesses and the way they look from the street. Type in your search query : you can not only see a picture of the business, you can also walk up and down the block, and see pictures of other businesses on the same street. I love the way they have integrated the images and GPS data to create a seamless walk-down-the-street experience. Looks luverly. If any of you are interested in watching the webcasts from the WEF summit at Davos, you can find them here. There are some really excellent panels on there. The session with Clinton, Obasanjo, Mbeki, Blair, Gates and Bono is excellent. There are also a couple of sessions with Narayana Murthy and so on. Definitely worth a look, if you have some time to spare. I return to a subject that's been discussed on this blog several times in the past -- does human behaviour consist entirely of reason or a combination of reason and emotion? The trend in economics, until recently, was heavily biased towards reason. New research emerging from psychology, neuroscience etc may cause the reason crowd (which includes me from time to time) some grief. The current bout of research is made possible by the arrival of new technologies such as functional magnetic-resonance imaging, which allows second-by-second observation of brain activity. At several American universities, economists and their collaborators in the neurosciences have been placing human subjects in such brain scanners and asking them to perform a variety of economic tasks and games. For example, the idea that humans compute the “expected value” of future events is central to many economic models. Whether people will invest in shares or buy insurance depends on how they estimate the odds of future events weighted by the gains and losses in each case. Your pension, for example, might have a very low expected value if there is a large probability that bonds and shares will plunge just before you retire. Brian Knutson, of Stanford University, carried out one recent brain-scan experiment to understand how humans compute such things. Subjects were asked to perform a task, in this case pressing a button during a short interval in which a certain shape was flashed on to a screen. In some trials, the subjects could win up to $5 if successful, while in others they would have to defend against a $5 loss. Before presenting the target, the researchers signalled to subjects which kind of trial they were in. Brain activity in certain neural systems seemed to reveal a strong correlation with the amount of money at stake. Moreover, the prospects of gains and losses activated different parts of the brain. Traditional economists had long thought—or assumed—that the prospect of a $1,000 gain could compensate you for an equally likely loss of the same size. In subsequent trials, subjects were given another signal: one that provided an estimate of the odds of success. That allowed the researchers to identify the regions of the brain used for recognising an amount of money and for estimating the probability of winning (or losing) it. Having identified these regions, the hope is that future work can measure how the brain performs in situations such as share selection, gambling or deciding to participate in a pension scheme. In one recent experiment, noted in our science section on October 30th, Mr Laibson and others found that the brain's response to short-term riches (in this case, gift certificates of $15 or $20) occurs largely in the limbic system, a region that governs emotion. By contrast, the prospect of rewards farther into the future triggers the prefrontal cortex, which is often associated with reason and calculation. Thus, choosing immediate economic gratification, by spending excessively on credit cards or not saving enough even though you “know better”, could be a sign that the limbic system is in charge. Identifying the parts of the brain that control economic actions is one thing. Harder tasks include determining how neural systems work together to create behaviour, and how wide is the variation in brain patterns between different people. Then there are age-old questions of free will: is your failure to save for old age simply a lifestyle choice, or is it down to faulty brain circuits? It's been a while since anyone has posted anything from the Economist. So, I figured the new economic numbers from China might be as good an excuse as any. Many of you may have already read that China's economy has grown at a blistering 9.5% in the last quarter. Most countries (India, for instance) would be happy with that sort of growth. Not China, which has been trying desperately to cool its overheating economy and attempting to soft-land it with measures that include increased interest rates, curbs on investment etc. It seemed to be working for a little while during the third quarter, but the economy seems to have returned to overheat mode. Why is this a problem, you might ask. The Economist provides the best known reasons. It's not pretty, especially given how much the world economy has come to depend on China to sustain growth. China may or may not be growing too fast, but it is certainly investing too much. In the year to the first quarter of 2004, spending on fixed assets—plant, property and infrastructure—grew by 43%. Investment accounted for 42% of GDP in 2003, and perhaps a still greater share last year. No economy can sustain such a colossal rate of capital accumulation. At some point, China’s investment must run into rapidly diminishing returns. Are two cement factories twice as good as one? If investors were betting their own money, these redundant cement factories—not to mention steel mills, luxury flats and car plants—would probably never have been built. But China’s reckless investment owes a lot to the heedless lending of its banks. Chinese households still save about 45% of their income. They deposit about two-thirds of these savings in China’s four big state-owned banks, which lend about two-thirds of these deposits to state-run firms. The banks pay little attention to risk and do not expect much of a return: perhaps 40-50% of loans are non-performing. In fact, their lending is best seen as a form of state subsidy. If these subsidies were added to the government’s books, China’s budget deficit would balloon to 18% of GDP. Suppose, says Ms Choyleva, that China can sustain a rate of investment of about 35% of GDP, rather than its current rate of 40-45%. How does it get there from here? Such a sharp contraction in the investment rate is not, she says, consistent with a soft landing. If investment slows, the economy as a whole will plummet. China, she predicts, cannot escape “the natural violence” visited on all developing countries that go through such boom-and-bust cycles of investment. I was watching the new version of Nova a little while back, called Nova Science Now, which consists of three short pieces rather than Nova's normal format of doing one big one. One of the stories was on the very interesting research being done on mirror neurons. To me, it sounded like one of the most important discoveries in neurosciences. Ever. Very briefly, mirror neurons are neurons that fire when you perform certain tasks, but also when you watch someone else perform the exact same task. For example, when you carry a bunch of heavy boxes down a street, these neurons fire away. They also fire when you see someone do the exact same thing and therefore you attempt to help the person, are concerned for the person, wince at the heavy load etc. This also explains why you get so involved in a sports game. Your neurons actually think you're in there playing the game. This discovery would help explain human features like empathy, imitation learning, language learning etc. Scientists have recently discovered that neurons in the premotor area that fire in preparation for upcoming movements also fire when we observe someone else carry out that action (Meltzoff and Prinz, 2002). Common brain regions thus process both the perception and production of a movement. The infant's observation of her parent's projecting tongue fires the premotor neurons that represent her tongue and this priming activates the related motor cortex neurons that project her tongue out in mimicry. We experience this mimicking phenomenon most commonly when we see someone yawn, and then typically have to stifle our own yawn. Since infants must learn many movements, they don't inhibit the mimicking of movements they observe. For them it's monkey see, monkey do (and it's interesting that the initial mirror neuron research was done on monkeys). Scientists are also exploring the relationship between mirror neuron activity and our ability to imagine our own planned actions, be empathetic, and develop articulate speech. Mirror neurons may thus eventually help to explain many teaching and learning mysteries in which modeling provides children with an effective behavioral pattern to follow – and to explain disabilities (such as autism) in which children can't read the minds of others. Here is an essay on the subject by the legendary Dr V.S.Ramachandran, which adds some evolutionary context to the discovery. You can also watch the full Nova segment here. I think all of use should read a great deal more about this since I have seen this being described at more then one place as the equivalent of Watson and Crick's dramatic appearance at the Eagle Pub. The next time you throw your hands up in frustration at what the Indian cricket does best, you know there's a bloody good reason for your frustration. My friend S.D. (who is Indian) is a reader of this blog and happens to have a Ph.D. in pharmaceutics and also happens to work for one of the "contemptible" big US drug companies. Recent posts to this blog [1 | 2 | 3] have addressed several problematic aspects of drug companies and the patent regime. Therefore, in true fair and balanced fashion (see blog title), here is a little piece from S.D. where she look at things from an insider's point of view. It would be foolhardy to try to explain things from an "opposite" point of view, because of sheer complexity of the matter. Nevertheless, I would like bring out certain points. First, re US drug pricing: Drugs are indeed one of the most risky businesses. Those who say that the risk is overplayed need only see the results of Vioxx, Merck's antiarthritic drug. Once a blockbuster, it now faces innumerable law suits. It is true that a company plans and saves assets for these eventualities. But where do you think these assets come from? They come from the apparently huge profit margins. Moreover, a company is not free from litigations from citizen advocacy groups even when its drugs perform well in the market. It has happened with almost any top selling drug you can name. Furthermore, though it seems a cliché, big pharma companies do spend huge amounts of money in R&D. The industry average is around 20% of its net profit, one of the highest amongst all industries, especially chemical industries (what happens to the remaining 80%, I will delve into later). Big pharma companies also have to deal with expiring patent issues. It is seldom recognized that while the success of a drug molecule can be shared by the parent company, and, after its patent life, by generic manufacturers, in the event of an adverse effect, however, it rests primarily on the parent company to deal with it, because they are the ones with the first clinical and tox studies. All this adds up to a substantial amount, which needs to be saved, even though they are available in liquid assets. I don't pretend to understand the marketing strategy of drug companies. But it is true that if there is a problem, sales, and a little less so marketing, are the first to be affected. R&D is usually cushioned from these hiccups (a part of the 80% remaining profit has some use), unless there is a bigger problem and then, funding is restricted. However, it needs to be understood that while sales and marketing can be fluid and strategies can change easily, stops in R&D are far more difficult to handle, both for the employees in the short term and the companies' pipeline in the long term. Hence, a considerable profit margin is set aside so as to deflect such adverse eventualities. I am not of the opinion that drug prices can't be reduced a little bit. However, I cannot agree that given the present managerial and institutional setup it can be reduced a lot, even if wanted by one or two samaritan companies or congressmen. Now, about the "me-too" drugs issue. This is the point which troubles me the most. Particular sections of the population react to different drug compounds differently, even though these drugs belong the same class. Sometimes we know the reason, sometimes we don't. That's why when a patient does not respond to a certain drug, oftentimes the doctor changes the prescription to a different drug, many times belonging to the same class. Me-too drugs are definitely necessary for benefit to a broader section of the population. As for Marcia Angell's article in NEJM, the same journal had once vaunted Vioxx's safety. Please don't think I disrespect the journal. It is one of the most highly rated medical journals. However, the accuracy of an article should always be tested with prudence. I should point out that I solicited this opinion from S.D. Keep in mind, of course, that all of this reflects her personal views and not those of her company. Moreover, she's speaking as a scientist, not as a business executive. Will the little guys win (a little)? [From Sadagopan] Rich Karlgaard writes in Forbes on Three Trends for 2005 - "V-blogs, cheap technology ably performing business chores and a new golden era for startups". The Asian tsunami tragedy brought a secondary wave of v-blogs. Sites such as the Australian Waveofdestruction.org were logging 1 million unique visitors per week at the peak. The curious clicked in to watch home videos of giant waves swallowing Thai hotels. Had John F. Kennedy been murdered in this day ofv-blogs and digicams, the Zapruder film would have been uploaded within hours for the world to see. Whether that would have been good for our souls is a separate issue. The Warren Commission, however, surely would have proceeded under different pressures. V-blogs are quite the emerging trend. Those who missed the tsunami coverage on TV as I did, and a few million who didn't, caught it on v-blogs. It was impossible not to be horrified by the sheer force of the destruction as seen on PunditGuy's blog. Karlgaard makes a point about emerging technology shifting into the hands of everyday consumers and small-business (as opposed going in to the hands of the rich and big business). This is just as true in India but in a different way - cell-phones and computers already hold promise of revolutions for the masses, but it is proceeding by adaptation of existing technology rather than by innovation. The point discussed in greater detail by Ray Ozzie in his interview with Tom Austin of Gartner. These days, the leading edge of technology has shifted into the hands of the consumer and small business-person, in the form of the TiVo, the iPod, and even the software they download and use. The people in one camp buy their computers pre-loaded from Dell. They download what they need. They don't worry about expensive, complex things like VPNs. They grab tools that say they solve problems they have. They use them, deal with spam and viruses in various ways and they get their jobs done. In the other camp, you have enterprise architectures and well-defined processes and procedures. You're focused on issues of compliance, leverage and cost reduction. But you're years behind in the OSs that you've chosen. You've implemented lockdown, and you have intentionally limited choices in messaging and in most all forms of software. The gap is growing; the sides are not coming together. The benefits of innovation are accruing to the little guys, not the big organizations. Many new innovations aren't burdened by things such as auditing and monitoring and enterprise controls. But they work. Regular readers of this blog know that I am no fan of Microsoft products or business practices. On the other hand, I hold Bill Gates in very high regard, especially the part of him that works with the Gates Foundation. More proof of Gates's extremely well-targeted interventions emerged yesterday with the announcement of a $750 millon grant to help vaccinate children in developing countries, especially in Africa. The contribution by Bill Gates was in addition to the $290 million announced by that NGO pretending to be a nation state, Norway. That makes it over a billion dollars to help with child vaccination programs. An estimated 27 million babies in the developing world aren't immunized each year, and in 2002, the most recent data show, 1.4 million children died from diseases that have been virtually wiped out in the United States. Every one of those deaths is totally unacceptable when we have an affordable and effective means to prevent those deaths," said Melinda Gates. GAVI's goal is to vaccinate 90 percent of children in the poorest countries by 2015. "That's a very achievable goal with the right resources," said Bill Gates, describing his foundation's contribution as a down payment and calling on rich countries to help fill in the gap. "I feel very good that over the next years government contributions to GAVI will be substantial. We're basically saving lives for less than $1,000 a life," he said. The money will be used to shore up distribution systems and buy urgently needed basic childhood vaccines such as diphtheria, tetanus, whooping cough, measles and polio in 72 of the world's poorest countries. It also will introduce vaccines for diseases such as hepatitis B, Haemophilus influenzae type B (HiB) and yellow fever to the countries that need them most. There are very few targetted interventions that can provide the same bang for the buck as childhood vaccinations, and I cannot applaud Gates's gesture enough. This man understands the development game better than most people who specialise in the field. So, it seems like Zoo Station did win the Indiblog award for best group blog. It's pretty cool to win a blogging prize by popular choice just a month after ABC News crowned bloggers as their choice for People of the Year. First, thanks to all our readers who voted for this blog. Second, thanks to all the rest of the team at ZS who have made this blog mighty readable. Congratulations are also in order for frequent ZS commenter and friend, Atanu Dey and the Deeshaa/RISC blog, which won the award for Indiblog of the Year. Thanks go out to Indiblog nominee Rajesh Jain, who convinced me to start Zoo Station way back in 2003. As duly noted on these virtual pages earlier, William Safire was to end his 31-year run as NYT op-ed columnist this month. He has just done so, and today's NYT features a final quartet of Safire columns: one explaining his decision to stop, a second reflecting on (dis)agreements between his opinions and the actual turn of events, a third reminding his unworthy readers (yet again) just how chummy he has been with a generation of power-wielders, and a fourth being the prescriptivist he always has been as he teaches you how to read an op-ed column. Prescriptivist or not, the latter column is a very entertaining read and reminds you that the man can laugh a bit at himself. It appears that Reuben was spot on when he speculated (in a private email, before Safire announced his plan to quit) that David Brooks has been brought in as a replacement. I just got back from India, and had the chance to look at Mindsport again. Mukul Sharma still runs an interesting column and, for those who have never seen it before, Mindsport is worth a look. I would like to, however, warn readers of Sharma's surprising political incorrectness. In a column a few weeks back, he went so far as to ask readers to 'go jump into the nearest well' (and I am quoting from memory here), if they couldn't solve a particular puzzle. Sharma has a tendency to rant, gloat and criticize. This can get pretty annoying for readers, confusing for young researchers and even demotivating. To put the puzzles in perspective, they are merely one way of measuring analytical ability. An ability to do well at solving these puzzles is not in itself anything more than one indicator of intelligence. High scores in such tests are not a guarantor of research ability but, of course, have a positive correlation. Amit, who has been to the International Mathematical Olympiad and is also involved in highly mathematical Computer Science research, might have more to say on this. Here is this week's endgame and the solution. There is a prison with 365 cells. Each cell has a lock which alternately opens and closes with the press of a single button on its gate. The jailer, for some weird fancy, starts his morning rounds on 1st January 2003 and presses all the buttons opening all the cells. On the next day, he presses the buttons on all cells which are multiples of two, closing them. Day three, and he does that to multiples of three, then four, and so on and so forth, till the end of the year when he presses the button on cell 365. Question: Which cell numbers are open and which closed on 1st January 2004? The solution and the rest of the post is out here. With George W. Bush's inauguration, the impression is the "right" has put the finishing touches on a conservative foothold in Washington D.C. But what hasn't been covered well is the dissent inside the conservative ranks. One fascinating critique comes from Paul Craig Roberts, formerly US Assistant Secretary of the Treasury for Reagan (1981-82) , Associate Editor of the Wall Street Journal editorial page and Contributing Editor of National Review. This is relevant to the award-winning Zoo Station because his latest editorial was published on OutlookIndia. Dr. Roberts has all the right pedigrees for being a loyal member of the right, but he says he went "overnight from being an object of conservative adulation to one of derision." But perhaps the most alarming charge, and one likely to make it un-publishable in mainstream American outlets, is his comparison of right wing fanatics with a more notorious group of fanatics. Today it is liberals, not conservatives, who endeavor to defend civil liberties from the state. Conservatives have been won around to the old liberal view that as long as government power is in their hands, there is no reason to fear it or to limit it. Thus, the Patriot Act, which permits government to suspend a person's civil liberty by calling him a terrorist with or without proof. Thus, preemptive war, which permits the President to invade other countries based on unverified assertions. In language reeking with hatred, the Heritage Foundation's TownHall.com readers impolitely informed me that opposing the invasion of Iraq is identical to opposing America, that Bush is the greatest American leader in history and everyone who disagrees with him should be shot before they cause America to lose another war. TownHall's readers were sufficiently frightening to convince the Heritage Foundation to stop posting my columns. Who's publishing his columns now? Counterpunch and Antiwar.com, two left-leaning alternative pubs. The acquiesence to the current administration is astonishing. It's not that they don't like advice from enemies. They don't even like it from friends. As we approach the 60th anniversary of the liberation of Auschwitz-Birkenau, a question I have often wondered about has also been appearing in the media. By 1944, the Allies knew of the existence of the extermination camps at Auschwitz, as these aerial photographs taken by the allied air forces show. So, why on earth did they not bomb the camps and put an end to the murder? Even assuming they lacked precision weapons, any damage caused by an Allied bombing would be significaantly less than the murders at the camps between May 1944 (when the first aerial shots were taken). The BBC picks up on this question. Information about Auschwitz reached new levels of detail following the escapes of two prisoners in April 1944, and two more a month later. Their combined testimonies formed the basis of documents known as the Auschwitz Protocols. By June 1944, Jewish groups were imploring both US President Franklin Delano Roosevelt and UK Prime Minister Winston Churchill to bomb the rail lines or the gas chambers in order to put a stop to the killing. Recently published reconnaissance images show the British photographed the camp from the air in August that year - suggesting that by 1944 the RAF had the capability to reach Auschwitz with bombers. However, with Allied troops moving through Normandy after D-Day and the Red Army at the gates of Warsaw in 1944, some believed the best way to destroy the death camps was to use all military resources to crush the enemy. Laurence Rees - writer and producer of the BBC's Auschwitz series - says the lack of proper consideration given to bombing the camp and a "dismissive tone" in some of the documents of the time give the sense that "no-one was bothered enough to make bombing Auschwitz a priority". "If they were exterminating British prisoners of war do we seriously think that we wouldn't have done all we could to stop it?" he asks. In the words of Auschwitz survivor Kitty Hart-Moxon: "Being the worst example, the Holocaust is central to understanding the causes of the genocides that have occurred in many parts of the world since the end of the World War II." For those of you who are interested, PBS is airing Auschwitz: Inside the Nazi State every Wednesday between Jan 19th and Feb 2nd. I watched the first episode and I thought it was very well done. (Via Dan Drezner) Discovery Channel and AOL have launched a poll to discover the greatest American of all time. Drezner himself seems to think Lincoln was the greatest. Can't find fault with that, really. If you scroll down his comments, you'll get a lot more ideas. I just haven't figured out whether naturalized citizens like, say, an Albert Einstein carry the same weight as a Lincoln or a Jefferson in the minds of people. I haven't thought up a list yet, but I think Benjamin Franklin would probably be in my list of top 5 Americans of all time. So would Bob Dylan (or one of the blues greats) for the impact on pop culture. So would Mark Twain perhaps? Harry Truman? I don't know yet....there are a LOT of names to choose from. Feel free to suggest a lot more names. If you'd still like to vote for Zoo Station in the best group blog category at the Indiblog awards, now's the time to do it. Voting closes tomorrow, the 22nd. A non-scientific belief system, especially one that is based on any kind of notion of a divine order, has some explaining to do, however. What God sanctions an earthquake? What God protects against it? Why does the quake strike these places and these peoples and not others? What kind of order is it that decrees that a person who went to sleep by the edge of the ocean on Christmas night should wake up the next morning engulfed by the waves, struggling for life?" Drug companies produce too many copycat drugs and too few innovative ones. Some reasons highlighted are the incentives of people working at patent offices and the FDA (they are paid on the basis on patent applications and drugs reviewed resp. Since it is easier to approve a drug than to reject it, more drugs are patented than should be.) Also, unlike what the companies claim, R&D expenditure is dwarfed by their expenses on marketing, administration and legal issues. Further, in research tests, the new drug is compared to a placebo rather than to an existing drug - this the author claims is a major problem and increases the number of me-too drugs out there. Crucial to these developments was an act, passed in 1980 (Bayh-Dole), that allowed tax-payer funded research at NIH (national institutes of Health) to be patented by small businesses and researchers and then grant exclusive licenses to drug companies. In addition she highlights how drug companies have been producing profits year after year, how drug companies have too much influence in the FDA, clinical research of their drugs and even drug education in schools, how patents are too elastic and how prices are too high (prices typically fall to 20% of its value when patents expire). I think the book does a great job in lifting the heavy rock that the pharma industry is - to reveal the worms beneath. Conservative Christians in the US have a new target - SpongeBob SquarePants. When I started reading this article in the NYT, I thought I was at Onion. The move to term a cartoon character as gay because he holds hands with an animated sidekick is the most asinine thing I've heard of. What will they do next? Ban Disney toons because Donald Duck doesn't wear pants? We at this fair and balanced blog believe that no opportunity to trash Bill Falafel O'Reilly must be wasted. Apparently Falafel O'Reilly has been claiming (and this is a must hear) to have "seen combat in Central and South America." To cut a long story short, the Sgt. Falafel Veterans for Truth Fund has set up a reward for anyone who can corroborate Sgt. O'Falafel's claim to have been in a firefight in a combat zone. The reward is now at $700. $700 is good money, but boy, this is going to be awfully difficult to win. Sanjay sent me this most interesting story about pygmy elephants being found in the Peppara sanctuary in Kerala. Before you scoff, have a look at the link, for there is a photograph that accompanies the story. Wildlife photographer Sali Palode and `Kani' tribesman Mannan encountered a small herd of five-foot-tall elephants in Peppara Wildlife Sanctuary in the State last week, sparking speculation whether the pygmy elephants the tribesmen of the region had been talking about were, indeed, real. They came across five of these elephants in a clearing close to the edge of the sanctuary. The animals scurried into the thickets on sensing human presence, but Mr. Sali Palode snapped a few pictures of one. But for their small size, the elephants looked like full-grown adults, according to him. He also ruled out the possibility of these animals being calf elephants, as calf elephants are not known to move in a herd of their own, unaccompanied by their elders.There were no normal-sized elephants in the herd. 'Kani' tribesmen living in the Agasthyavanam Forests in southern Kerala had for long been talking about pygmy elephants, which they call `kallana'. The WWF had established (by DNA testing) in 2003 the presence of a distinct sub-species of pygmy elephants in Borneo. This paper introduces a new internationally comparable data set that permits an empirical investigation of the effects of patent law on innovation. The data have been constructed from the catalogues of two 19th century world fairs: the Crystal Palace Exhibition in London, 1851, and the Centennial Exhibition in Philadelphia, 1876. They include innovations that were not patented, as well as those that were, and innovations from countries both with and without patent laws. I find no evidence that patent laws increased levels of innovative activity but strong evidence that patent systems influenced the distribution of innovative activity across industries. Inventors in countries without patent laws concentrated in industries where secrecy was effective relative to patents, e.g., food processing and scientific instruments. These results suggest that introducing strong and effective patent laws in countries without patents may have stronger effects on changing the direction of innovative activity than on raising the number of innovations. Read the whole paper here. To summarize, there are two kinds of innovations: those that are most profitably patented (you can't keep them secret forever) and those most profitable as trade secrets (think Coca-Cola). So if your country doesn't have patents laws, pretty obviously you are going to focus your innovation efforts on the latter. And you may produce a lot of innovation that way. Note however, that this does not mean that you will have *more* innovation than a country that offers both patent *and* trade secret protection. That would depend on how much time one spends in simply try to figure out if a patent is violated in the process of innovation and the amount of enforcement costs. Clearly as the number of existing patents increase this will be a problem. Even innovators might end up spending too much on needless litigation to avoid lawsuits or suing potential innovators. Finally, with regards to drugs, a basic question remains, is the increase in price (and the potential social welfare losses) less than the gains of innovation. In India, this is unlikely to be the case, especially if you consider the number of people affected (and beneficiaries of indian drugs are wordwide, as Reuben notes in his post) and if you consider the fact that innovation in the industry was not stunted before the patent laws! So, you thought DVD players that only played discs from a certain region and not from others was annoying? The Wall Street Journal has news for you in a story titled Electronics Without Borders. Apparently, a lot of firms including HP and Apple have taken region coding to heart and have implemented measures that disallow usage of electronics across borders. Some consumer-electronics companies are designing products so they will work only in the U.S. H-P has quietly begun implementing "region coding" for its highly lucrative print cartridges for some of its newest printers sold in Europe. Try putting a printer cartridge bought in the U.S. into a new H-P printer configured to use cartridges purchased in Europe and it won't work. Software in the printer determines the origin of the ink cartridge and whether it will accept it. The company introduced region-coding on several printers in the summer so it won't have to keep altering prices to keep pace with currency movements. H-P eventually plans to introduce the concept across its entire line of inkjet printers. Similarly (ed), the new iMac G5s sold in the U.S. are designed to work only with the electric power systems in the U.S. and Japan, which pump out a lower number of volts than in most other countries. The iMac G5s Apple sells everywhere except the U.S. and Japan are dual voltage, meaning they can cope with the electrical systems in Fiji, Europe and most of Asia, as well as those in Japan and the U.S. Nintendo Co.'s latest hand-held game machines are sold in the U.S. with power adaptors that don't work in Europe. Such measures prevent thrifty foreign consumers and gray marketers -- traders who sell goods through channels that haven't been authorized by the manufacturer -- from taking advantage of the decline of the dollar against the world's major currencies to buy lower-price products in the U.S. In terms of euros, pounds or other strong currencies, U.S. retail goods are much cheaper today than they were two years ago. Consumer groups make an excellent point in response to these moves by the electronics majors. "Manufacturers don't like global commerce when it doesn't line their pockets," says Phil Evans, principal policy adviser at Which?, a British consumer watchdog. "In the long term, it's not a clever thing to do from a customer-relations standpoint." Spot on. Globalization is wonderful as long as it doesn't hurt the firm seems to be the way they understand globalization. Almost unnoticed, India's pharmaceutical patent regime changed in 2005 from recognizing only process patents to recognizing product patents as well, in order to meet TRIPS commitments. This is a move that is going to hurt nearly everyone in the short term, especially given that most Indians do not have medical insurance. The new patent regime cleared by the Manmohan Singh government to meet World Trade Organisation (WTO) deadlines will raise the price of life-saving drugs by at least 10 to 20 times the current price. An essential drug to treat cancer that currently costs Rs 9,000 to Rs 12,000 will spiral to Rs 1.20 lakhs after the product patent regime's impact is felt in the market. Patients suffering from cancer, HIV/AIDS and heart diseases will be most affected by the new regime as drugs for these ailments will be affected in the first term. Prices of all life-saving drugs, however, will also be increased over a longer span of time as the government has reportedly not adopted a "safety mechanism" in the Patents (Amendment) Ordinance to protect the interests of the common people. The government, which has dismissed these fears as "misplaced", has been unable to convince experts in the country who are strongly of the view that the new "product patent" regime will prove disastrous for Indians. In a major study carried out by the Centre for Study of Global Trade Systems and Development, it has been indicated that the prices of drugs for even ailments like hypertension, strokes, ulcer, depression and osteoporosis will go up under the new regime to equal international prices. For instance, the medicine Prilosec, used to treat ulcers, currently costs $2.45 in India as against $105.50 in the US. The impact of the government's measure will soon raise the price of this particular drug to equal US prices. The New York Times latches on to India's changed patent regime in an editorial piece published today. India has become the world's supplier of cheap AIDS drugs because it has the necessary raw materials and a thriving and sophisticated copycat drug industry made possible by laws that grant patents to the process of making medicines, rather than to the drugs themselves. But when India signed the World Trade Organization's agreement on intellectual property in 1994, it was required to institute patents on products by Jan. 1, 2005. These rules have little to do with free trade and more to do with the lobbying power of the American and European pharmaceutical industries. India's government has issued rules that will effectively end the copycat industry for newer drugs. For the world's poor, this will be a double hit - cutting off the supply of affordable medicines and removing the generic competition that drives down the cost of brand-name drugs.But there is still a chance to fix the flaws in these rules, because they are contained in a decree that must be approved by Parliament. Heavily influenced by multinational and Indian drug makers eager to sell patented medicines to India's huge middle class, the decree is so tilted toward the pharmaceutical industry that it does not even take advantage of rights countries enjoy under the W.T.O. to protect public health. I cannot begin to emphasise the need for everyone in India to be more cognizant of this change. Not only does it hurt Indians (both poor and rich) badly, but it will hurt people in other developing countries too. While I do agree that innovation needs financial incentive to occur and safeguarding intellectual property is a good idea within limits (this will also benefit Indian pharma companies like Ranbaxy and Cipla), one must be very careful while twiddling with rules concerning health and life saving drugs. The Indian govt's claim that 97% of the drugs available in India are off-patent anyway is probably true, but is absurd nevertheless. Try saying that to someone who needs a medicine to save his life from the remaining 3% of drugs and can't afford to pay for it. I understand this a very dicey issue and I certainly have no solutions to offer in terms of balancing incentives for pharma companies to innovate and the health of people in developing countries, especially the poor. Maybe a national health insurance system is the answer, but how will the govt pay for it? Who can afford to pay for drugs whose prices may increase 10-fold and more? I think it would be wise for the govt to slow down a bit and think about some solutions instead of forcing the patent change through a presidential ordinance. Airbus unveiled the biggest passenger aircraft the world has seen, the A380, in Toulouse earlier today at a ceremony attended by practically every European leader of significance. The aircraft has a wingspan of 80 metres (262 feet), overall length of 73 metres (239 feet), height of 24 metres (79 feet) and maximum take-off weight of 560 tonnes. 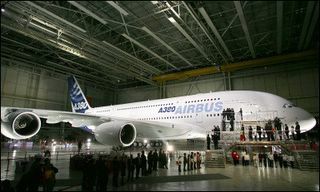 Given that Airbus already had 140 odd secure orders for this aircraft before today, I am guessing Boeing is in trouble. Richard Branson, whose Virgin Atlantic has already ordered a few of the A380's, announced plans to introduce double beds and a casino on the Virgin A380 flights. As Sir Richard put it, as only he can, "you'll have at least two ways to get lucky on our flights." Sir Richard wasn't the only one with snarky comments at the A380 unveiling. German Chancellor Gerhard Schroeder had this to say -- ""Good Old Europe has made this possible." Ouch, Mr Rumsfeld. Smart Travel Asia has an update for travellers about the situation on the ground in all of the Tsunami hit areas. Judging from the updated pictures and videos, it does seem like the clean-up effort has been reasonably successful. Vijay Verghese, the editor of STA lists a bunch of reasons why you will be contributing to the rebuilding of the hard-hit local economies and doing the region a favour by not cancelling your travel plans. Asia’s holiday coast needs more travellers with the money and the moxie to make a difference. Tourist dollars offer a valuable life-sustaining injection that Asia cannot do without. Importantly, travel dollars percolate straight into the local economy where help is most needed, rather than vanishing into administrative blotting paper with just a fraction of the money reaching intended parties, as is often the case with international aid organisations. It is also time for Asia’s tourism industry to link hands on a common platform and reorder priorities. Among the first casualties of natural disaster and war, is travel, in particular, long-haul travel. It is time then to rediscover Asia and – in a burst of good neighbourliness, as indeed marketing common sense – to redirect promotional dollars within the region to secure high-spending frequent travellers. It is mainland visitors in Hongkong who top the per capita spending charts, not wealthy travellers from Europe or America. It is true that Asia has yet to discover Asia. Yet, there is no better time than now. The challenge for Asia is to convert the groundswell of sympathy that has brought the world together, into usable hard cash (in addition to well-meant pledges) that can fuel longterm recovery after the immediate Bandaid funds are gone. That will bring the lights - and smiles - back to Asia's traumatised holiday coast. Then, after the mourning, there can be a morning after. Travel dollars cannot bring back life, but they will ensure longterm livelihood for many. And that must be the ultimate aim of concerned persons everywhere. Spend your money where it can do the most good. Travel safe. But do travel. After Burt Rutan, Paul Allen and Richard Branson, it is now the turn of Amazon founder Jeff Bezos to get serious about the space race. Until now, Blue Origin, a private firm promoted by Bezos existed on paper, but about which not much was known publicly. All that changed today with the announcement that Bezos has bought 165,000 acres of land in west Texas. Bezos intends to build a rocket-testing range — and possibly a spaceport — on the high desert north of town. The plans are part of Bezos' secretive Blue Origin operation, headquartered in a warehouse on East Marginal Way in Seattle. The company has no listed phone number, and Bezos and his spokespeople have steadfastly declined to reveal many details. The company's first project will be a reusable spaceship to carry three people or more to the edge of space and safely back to Earth, said Bruce Hicks, a Blue Origin spokesman. The craft will launch vertically, like the classic rocket ship of science-fiction movies, and will land vertically as well. West Texas is a good place to do that, Hicks said. "It's isolated, and that has a distinct advantage in development and testing of rockets." Van Horn has a population of 3,000 and is about 120 miles east of El Paso. Blue Origin's research and development work will remain in Seattle, Hicks said. The company has assembled a small staff of top-notch designers and engineers, many of them veterans of the space-shuttle program and other projects, such as the DC-X, a vertically launched rocket developed for a missile-defense system. Newsweek magazine reported last year that developing the suborbital spaceship will cost Blue Origin about $30 million. Allen spent $20 million to develop Rutan's SpaceShipOne. Whatever it is with the ex-tech millionaires (Paul Allen, Elon Musk and now Jeff Bezos) and space flight, this is excellent news for space freaks. Burt Rutan's crew managed to do the sub-orbital thing just to claim the Ansari X-Prize. Imagine what 3 competing visions, backed by deep pockets, could do to shake up the space industry. Someone should actually put up some money like the X-prize did as a reward for a full orbit of earth. Apart from a strong fraternity of excellent filmmakers and an increasingly disillusioned student body, Iran has few critics of the state of affairs of a nation which was once among the most progressive in the Islamic world. But it appears there are a few brave bloggers who, despite the threat of imprisonment, use the Internet to air their views. In this article in The NYT, Nazila Fathi profiles Mohammad Ali Abtahi, a former vice-president of Iran, who maintains a blog on political developments, government policies, religion and daily life in Iran. I went through some of the articles on Abtahi's blog and found them insightful and offering a rare peek into what I think is a fascinating culture. The National Intelligence Council at the CIA, responsible for mid to long-term strategic planning, has just released its assessment of the world in 2020 called Mapping the Global Future (full report available at this link). The Toronto Star has the details. The unclassified forecasts offer a range of scenarios about the world 15 years on. Officials caution they are not meant to be predictions certain to come true but rather long-term outlooks designed to stimulate debate. The council predicts an emergence of new global players — almost certainly China and India — but whether these new players fit into the world co-operatively or competitively remains an important uncertainty for the U.S.
Council vice-chairman David Gordon said the changes ahead could be "a very bumpy ride." Among them, he said, the integration of 1 billion low-paid workers will cause global shifts in rich and poor nations alike. Changes will be experienced politically, economically and even culturally, as Korean pop singers gain international popularity and India's Bollywood movie industry outshines Hollywood. "Of course, the United States is in good shape to participate in this world, but it will be a world that will be much more competitive for us," Gordon said. The New York Times announced yesterday the death of Spencer Dryden, drummer for the legendary Jefferson Airplane (and also the New Riders of the Purple Sage). He was heard on hits like "Somebody to Love" and "White Rabbit" and on the group's other albums, including "After Bathing at Baxter's," "Bless Its Pointed Little Head," "Crown of Creation" and "Volunteers." The death certificate lists cancer as the cause of death. TRIVIA UPDATE: Apparently, Dryden was the nephew of Charlie Chaplin. I didn't have the foggiest. JPL has released a wonderful image of Titan sent back by the Huygens probe. You can click on the image for a higher resolution image. 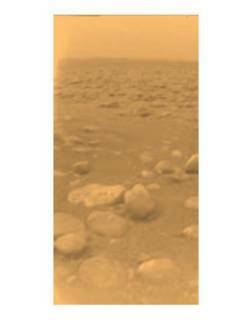 This image was returned yesterday, January 14, 2005, by the European Space Agency's Huygens probe during its successful descent to land on Titan. This is the colored view, following processing to add reflection spectra data, and gives a better indication of the actual color of the surface. Initially thought to be rocks or ice blocks, they are more pebble-sized. The two rock-like objects just below the middle of the image are about 15 centimeters (about 6 inches) (left) and 4 centimeters (about 1.5 inches) (center) across respectively, at a distance of about 85 centimeters (about 33 inches) from Huygens. The surface is darker than originally expected, consisting of a mixture of water and hydrocarbon ice. There is also evidence of erosion at the base of these objects, indicating possible fluvial activity. Henry Blodget, once the poster child of the 'new economy' and Merill Lynch's star analyst and later defamed in fraud allegations, writes in his commentary for Slate. The sad truth is that sound investment policy is boring. Diversify, reduce costs, aim to earn the market rate of return—even Stephen King would have trouble telling stories about that. But for the financial media to survive—at least the financial media devoted to helping you "profit" from reading/watching/listening—they have to suggest, over and over again, that there are exciting new places to put your money or dangerous places to remove it from. They have to tantalize you with the latest, greatest mutual funds or the "Ten Hot Stocks for 2005." They have to make you drool by observing, again and again, that every dollar invested in Microsoft's IPO in 1986 would be worth about $300 today. (Next time, it will be you!) They have to enumerate new ways to refinance your house, consolidate your debt, track your investments, pick better stocks, beat the pros, buy treasuries, retire rich, or make millions. They have to keep you watching, listening, and reading, or else they—not you, they—will go bankrupt. What's surprising is not so much the commentary as much as the source! (Read Blodget's description of his career and potential conflicts of interests here.) Well, sounds like a man reformed blaming the system? Yesterday, I came across a website that examines the candidates for the post of the President of the World Bank and the intrigues surrounding the selection process called Worldbankpresident.org. I know this seems like a highly esoteric subject, but this is the sort of decision that has the potential to affect large numbers of people living in the developing world. Yet, the developing world has practically no say in the selection process. Though there are names like Jeff Sachs, Larry Summers and Anne Krueger who have prior experience working on issues relating to the developing world on that list, the rest of the candidates reads like a roster of American political apointees. At least two of them can now be ruled out. Zoellick is now deputy to Condi Rice while Stan Fischer is the new governor of the Central Bank of Israel. I am not sure Bush would be that keen on Powell or Clinton either given the star power they would bring to the job. The Economist adapts data from the UNESCO to provide information on something most of us are interested in -- which are the world's most widely spoken languages? 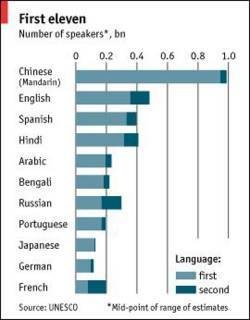 And how many people speak these as a first language and how many speak them as a second language? I personally think the number of English speakers are underestimated, especially if you consider use of English as a second language. Add the middle/upper middle classes of India, the United States, the Commonwealth countries and I suspect you will end up with a number well in excess of the 500 million in this figure. And this is not including western Europe where at least 2/3rds of the population speak English with some level of fluency. The nominations for the Indiblog Awards have been announced. Zoo Station has been nominated as one of the best group blogs. In the Indiblog of the Year category, several friends of ZS have been nominated including Rajesh Jain (who motivated me to start this blog in the first place), World is Green (Suhit's blog) and Atanu Dey. Also in the running are the fantastic Giga Om and the newly launched Tsunami Help. If you'd like to vote for Zoo Station in the best group blog category, vote here. It is difficult to resume something mundane like blogging after the catastrophe all of us witnessed on Boxing Day. I still find it difficult to fully comprehend the scale of the devastaton. All of us here at Zoo Station decided that we would resume blogging, but we would keep the Tsunami Relief Post alive for as long as is necessary. Rather than keep the post on top as we've done the past 10 days, we decided that we would instead provide a link to it above all the other posts. Anyone wanting to have a look at that post again can simply click that link. I thought I'd resume normal blogging with a story of how an architectural marvel actually withstood the fury of the Tsunami. The Shore Temple at Mahabalipuram somehow managed to stand its ground, in addition to offering protection to everyone caught inside. How a building constructed in the 6th century AD withstood the Tsunami while buildings built last year collapsed will remain one of the mysteries of this catastrophe. In addition, T.S. Subramanian reports that the Tsunami provided archaeologists with a serendipitous discovery. Some structures and rocks, perhaps the components a of a complex of which the Shore Temple at Mamallapuram was originally a part, came into view when the sea initially receded from the shoreline before the waves hit back with brute force on December 26, according to accounts provided by eyewitnesses today. But these objects were promptly submerged when the waves came back. According to Dr. Satyamurthy, what came into view could be "structural members and remains of the continuation of the Shore Temple on the east, running towards the south." He said it was clear that more architectural structures remained submerged beyond the Shore Temple.